This is a collection of articles about the greatest tool box I've ever owned, the Stanley Workforce Tool Box/Organizer. If you've been following along over the past year, then you're familiar with my quest for the best DIY toolbox. And during this journey, the best tool box was found, lost, replaced, re-replaced with a different box, replaced again, and then finally returned home to once again to take it's place as the best tool box. To make it easier for you to find the exact information you're looking for, I've laid out the story of the Stanley tool boxes in four sections. You can choose to either read this in its entirety or simply click on the specific article title listed in the Table of Contents below. The original article: "Best DIY Tool Boxes and Organizers" is about the original Stanley's Workforce tool box organizer. The second article: Best DIY Tool Box – Quest for the Best Part 2" is about Stanley's changes to the box, it being discontinued, and then it being replaced with something totally different. The third segment: "Sighted and Captured" was about the three replacements tool boxes I recommended as a substitute for the discontinued original Stanley tool boxes. And finaly... this is the latest news on the re-release of the original Stanley Workforce Tool Box/Organizer – The best DIY Toolbox you can own. Once gain thanks for your input and patience throughout. And a big thanks to Stanley for continuing to provide us with great DIY tools. Tool Boxes, Quest for the Best. Here’s the problem. We all have a tool box or two around the house, right? But no matter which cool tool box we buy, it only ends up as a pile of tools in a box. You know, totally disorganized, heavy, taking up too much space and you can't see what’s at the bottom of the pile. Well, a cardboard box could do just as well. You may even own one of these popular tool box styles. 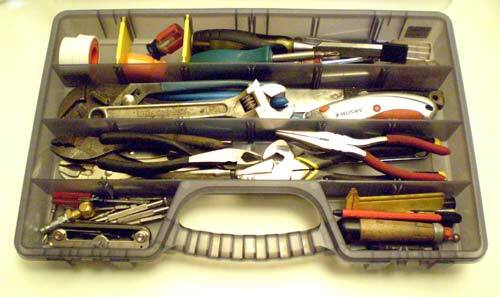 Even if you have a multi-drawer tool box that’s well organized, it's too big and heavy to lug around. Anyway, the fact remains that for the majority of do it yourself projects you only need the essential tools, not every tool you own. I’ll bet, like me, you hardly ever take your tool box to your project, you just try taking the tools you think you'll need. Inevitably, you end up running back and forth. What a waste of time! Here's the simple solution that will make it easier to; carry your tools to your project, find your tools, and save space and money. I know, sounds like a pie-in-the-sky dream right? It's not. 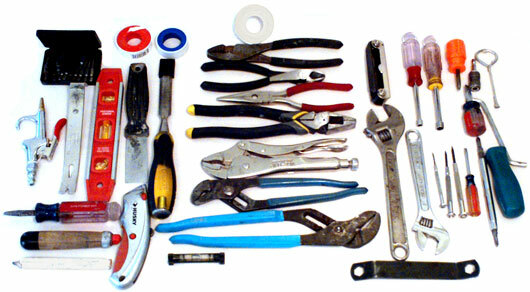 And I'm going to reveal to you an amazing tool box you'll love forever. 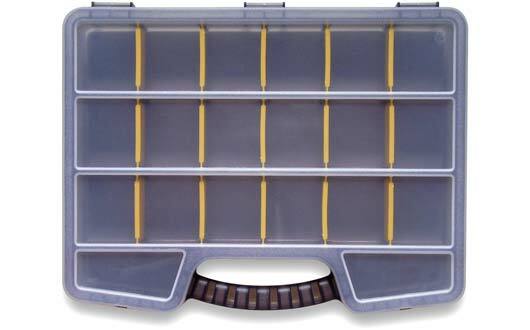 One day I was strolling through my local home center looking for a divided box to store my fasteners when I spotted a multi-section plastic organizer. It was different from others I'd seen before. It was made of heavy duty plastic, had adjustable sections, a locking clear lid, a good strong handle and the lid closed tight against the dividers so nothing can not jump from one section to another -- even if dropped. 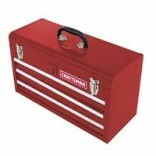 This tool box is only 18" W x 12.5" D x 3" H, which makes it's easy to store just about anywhere. Sensing I found buried treasure, I immediately grabbed the case and started playing with it right then and there on the floor. You may laugh, but hey, I’m a tool guy! So, I bought it and headed home. When I got home I started thinking, "Hey, I wonder if my hand tools will fit in this case?" So I got the hand tools I use most often (the same ones in the (Essential Hand Tools PDF) plus a few others, and began arranging them in the case. I was totally amazed, everything fit (even the extra tools I carry)! This tool box makes it so easy to actually carry your tools to your project and quickly find the tools you need. And get this, they're even stackable! I can't begin to tell you how much space you'll save. But the big bonus is the incredibly low price. This tool box costs less than $10 bucks! What an amazing deal. I can't imagine how much I would have saved if I'd only found this tool box earlier. I'll bet I've spent hundreds of dollars on tool boxes over the years and none of them have been as good as this one. 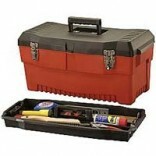 DIY Tip: DIY guy's love tool boxes, specially when they're as functional and durable as this one. Trust me, it would make a great gift for your husband, Father, son, brother, etc. Take my advise, the next time you're at Home Depot, go to the tool organizing isle (generally located next to the power tool section) and buy the Stanley Workforce compartment organizer. You won't be disappointed. By the way, I went back and bought two more of these incredibly useful tool boxes, one for my fasteners and a second for my electrical gear. It's amazing how much less space these three new tool boxes take up versus just one of my old tool boxes. Just one more do-it-yourself solution to help you succeed with speed! 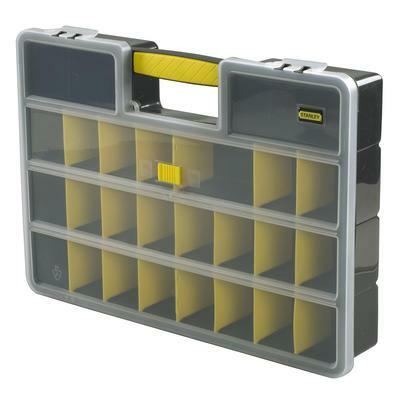 The Work Force 26 has been replaced with the Stanley 25 Compartment Organizer. It's the same exact box, only now branded with the Stanley name. See below photo. 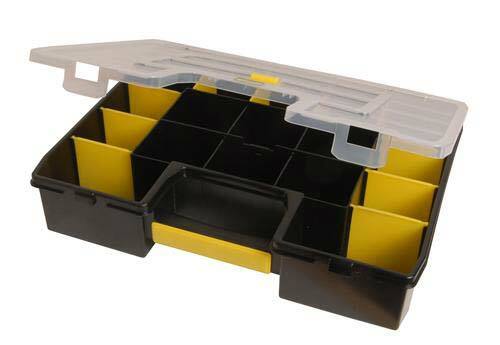 Description from JEGS: 25 Adjustable Deep Compartment Small Parts Organizer. Built-In Handle With 2 Locking Tabs And Lid Lock So Parts Stay In Place. Ideal Tool And Small Parts Storage And Organizer For Carpenters, Mechanics, Handyman, Toys And Hobbies. NOW ONLY AVAILABLE FROM JEGS. 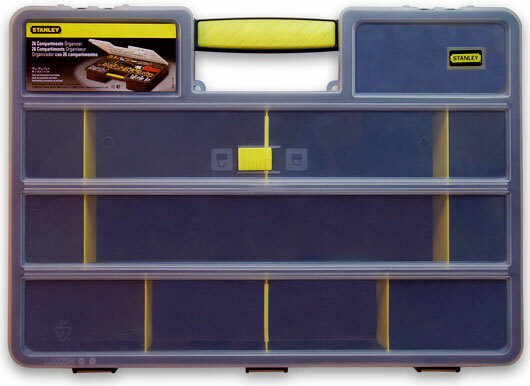 Stanley has discontinued this tool box and it is no longer available at Home Depot, it's NOW ONLY AVAILABLE FROM JEGS. Home Depot has assigned the SKU# from this old box to a new Stanley box. IT IS NOT THE SAME AS THE OLD BOX, so beware and just order from JEGS. I'm currently investigating a new, available, tool box and will post my finding soon. Good news! After weeks of searching, I believe I have found a replacement tool/parts box. In fact, I found a set of three different size boxes (small, medium and large). I have ordered the boxes and will be testing them shortly. I have finally received, and am currently testing three new tool boxes, similar to the Stanley. They look and work great so far. The quest for the best tool box continues. But with a happy ending. If you've visited the site before, you may have read my article "Tool Boxes, Quest for the Best" about a great DIY tool box and it's untimely demise. If not, here's the scoop. and started recommending it to friends and family as well as all my readers and clients. Then, out of nowhere, I began receiving emails that no one could find or buy these tool boxes anywhere. Sure enough, I went to Home Depot's website and attempted to order the Stanley tool box. When I got to the checkout portion of the process, a pop-up message said, "this Stanley tool box is no longer available". "Unfortunately, this item has been discontinued and is no longer available." "There are comparable items on our website, please look under organizers." As I had already reviewed their website for available products and found none, this was of no help. So I went to Home Depot (the only vendor that sold the Workforce 26 and attempted to locate the tool box. And sure enough, the plastic Workforce 26 organizers were no longer available—and there was no replacement. Over the next few weeks, I kept searching for a replacement box online and whenever I was at Home Depot. Then one lucky day, a new tool box showed up on the shelves. As it turns out, this new tool box, from Stanley, was the same design as the Workforce 26 tool box. The only real difference was the black color and a slight change in size (the new box was larger). The other (and much bigger) problem was that even though this "new" box wasn't exactly the same, Home Depot gave it the same SKU (product ID number) as the old tool box. So, even if you wanted to track down any of the remaining older boxes, you couldn't because they both have the same SKU number. Genius! OK, stay with me on this because what happened next was unbelievable. Stanley discontinued the new box even before they stocked the shelves! So the "quest for the best continued once again." So once again I returned to Home Depot. I wanted to see if I could find any of the old Stanley tool boxes they might have left in stock. When I inquired at the counter I was told they had plenty. Plenty? Well they did have lots of boxes, but it wasn't the same tool box! 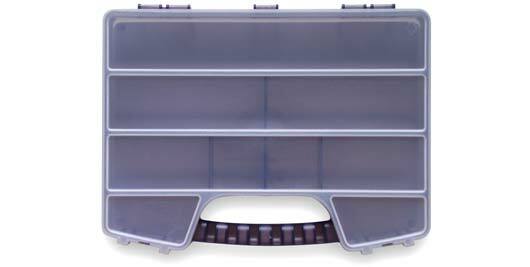 This new organizer has fixed center compartments, making it unsuitable as a tool box or as a truly customizable parts organizer. If you have a minute, please let me know what questions, problems or suggestions you might have, as well as your DIY successes. Continuing to help you succeed with speed. After months of searching, the hunt is for the best tool box is over. After an exhaustive search and thorough testing here are the tool box organizers I've found to replace the Stanley Workforce tool boxes. These new toolbox/organizers come in three sizes to accommodate all your storage needs. 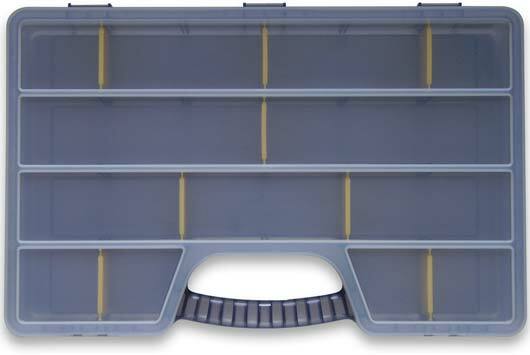 They're made of heavy duty plastic, have adjustable sections for easy customizing, a clear lid to see all your tools or parts, a good strong, wide handle, and the lid closes tight against the dividers so nothing can not jump from one section to another--even if dropped. And, they're stackable, so you save tons of space. 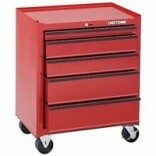 This large tool box will easily hold all the hand tools you use most often, plus a few others. Now it'll be easy to carry your tools to your project and quickly find the tools you need. Here are the same tools from The Absolute Essential Tools Every Do-It-Yourselfer Must Own PDF laid out here, plus a few more. Check out the PDF for a full list of the essential tools every DIY'er should own. Now, here's all those tools neatly stored and ready for easy transport. It's just amazing how many tools can be stored and easily accessed from one tool box. You can stack three of these boxes in the same space as one regular tool box. 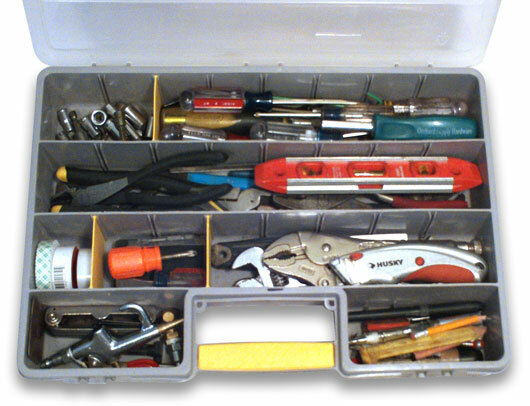 Definitely one of the best do-it-yourself tool box/organizers you'll find, buy, and happily use. The medium organizer is great for holding fasteners, electrical gear, technician tools, or whatever you need to keep sorted and transport securely. Great size! Note: All the yellow dividers are removable. I use this smaller organizer to hold my stainless fasteners, and other specialty items. Perfect fit! Note: 9 total compartments-1 full, 2 lg, 2 md, 4 sm. DIY Tip: DIY guys and gals love tool boxes, especially when they're as functional and durable as these. Trust me, this would make a great gift for any DIYer you'd like to make smile. And Yes, I did talk to the manufacturer and they reassured me that these boxes will not be discontinued anytime soon. So get organized and you too will succeed with speed. The new DIY Best Tool Box and Organizers have been tested and are ready for your approval and purchase at DIY Best Tool Boxes. Thank you once again for your patience. Stanley has been in contact in the last couple of months and told me that the Workforce toolbox/organizer with be re-released in October of this year. I'll let you all know when and where just a soon as Stanley let me know. Hang in there, and thanks for your patience. Great news! 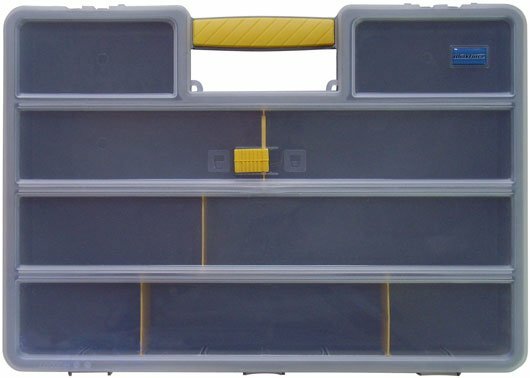 I have just been advised, by the Stanley product manager, that the original Workforce tool box/organizers (14006) have been re-released and will be available at Target stores to start. Stanley promised to advise me of other locations that the box will be available at ASAP. I have been informed by many of my readers that they have been unable to find these boxes at Target, except at a couple of Super Targets. I have searched the cities around where I live and haven't found any either. I contacted Stanley and Target again and they are of little help. So, I guess we're out of luck again. Maybe if Stanley gets enough request for this box they might "really" bring it back, but don't hold your breath. Note that the boxes you see on Lowes and Home Depots site are not the original boxes. They are the new ones with the fixed center section. Hello Larry- After a lot of trying, I was able to find a source for the original Stanley 26 compartment box. I have about 25 of the ORIGINAL original Workforce26 and ZAG 26 boxes, so being able to find additional ones that stack nicely on top of my existing boxes was nice. In the past, I have tried other copies (from EBay, Summit Racing, etc) that look similar, but are far inferior (JUNK!!) and don't even stack upon one another! That being said, I am still happy to have a source of genuine Stanley boxes. I bought 10 of them from Allied Electronics right here in California. Apparently, they're still easily available in Canada (Home Depot) and Europe. They were easily ordered from Allied, and didn't take long to receive. It seems like you were as disappointed as I was to learn that the good ol' Workforce26 was no longer available, so I hope this makes you and your readers happy! Stanley has re-released the original tool box/organizer! You can now find the ORIGINAL TOOL BOX here at JEGS and for only about $8 bucks. I’m laughing out loud because I have been on a similar “quest” for the last year or so. I have a collection of eight of the old Workforce boxes which has grown as I needed it to over the years, adding one or two as I’ve added to my collection of plastic miniatures. I, too, noticed with shock and despair that Home Depot stopped selling the old boxes and tried using the new ones. I, too, was dissatisfied with the fixed compartments. What good news that the old boxes are finally available again! Looks like I’ll be headed to Target this weekend! Has anyone been able to find these recently? It’s May 17th, 2012, and I bought these on lowes.com via ship to store, but when I got there, they gave me the fixed compartment 14026 model. Apparently in their system, the 2 model numbers have the same item number, so they can’t tell the difference. I have never seen these in store. Thanks so much for your offering, as many people were left out in the cold when the Stanley organizer was taken off the market. I did find a website that sells a similar organizer http://bit.ly/aBvGPT The only difference is that they don’t stack very well. Other than that there’re great, and only $10 bucks. Thanks again for dropping by DIY Answer Guy and your valuable input. I am very interested in your research regarding the Stanley 25 compartment organiser. I bought a couple of these a few years ago and found them to be excellent. I have been trying to buy extra ones ever since, but have never found any. I will keep an eye on your site to see if you are successful in locating them again. I don’t know exactly who Jegs is getting these from but I’m happy there’re available. I still cant locate the Stanley large organizer at lowes stores or thier home page.